So what’s a Majorana fermion then? A news item in today’s Nature reminds me that last week it was all happening with quantum computing at a meeting of the American Physical Society. IBM announced a breakthrough in the technology, predicting practical computers of unimaginable power within 10 or 15 years. And in Nature Eugenie Samuel Reich discusses what seems to be a discovery of cosmic importance by a team in Delft, announced at the APS meeting. I’ll sum up two strands of progress in a brief update. For a second revolution in information technology, the experts looked to the spooky behaviour of electrons and atoms known in quantum theory. By 2002 physicists in Australia had made the equivalent of Shannon’s relays of 65 years earlier, but now the switches offered not binary bits, but qubits, pronounced cue-bits. They raised hopes that the first quantum computers might be operating before the first decade of the new century was out. Whereas electric relays, and their electronic successors in microchips, provide the simple on/off, true/false, 1/0 options expressed as bits of information, the qubits in the corresponding quantum devices will have many possible states. In theory it is possible to make an extremely fast computer by exploiting ambiguities that are present all the time, in quantum theory. If you’re not sure whether an electron in an atom is in one possible energy state, or in the next higher energy state permitted by the physical laws, then it can be considered to be both states at once. In computing terms it represents both 1 and 0 at the same time. Two such ambiguities give you four numbers, 00, 01, 10 and 11, which are the binary-number equivalents of good old 0, 1, 2 and 3. Three ambiguities give eight numbers, and so on, until with fifty you have a million billion numbers represented simultaneously in the quantum computer. In theory the machine can compute with all of them at the same time. Such quantum spookiness spooks the spooks. The world’s secret services are still engaged in the centuries-old contest between code-makers and code-breakers. There are new concepts called quantum one-time pads for a supposedly unbreakable cipher, but some experts suspect that a powerful enough quantum computer could crack anything. Who knows what developments may be going on behind the scenes, like the secret work on digital computing by Alan Turing at Bletchley Park in England during the Second World War? The Australians were up-front about their intentions. They simply wanted to beat the rest of the world in developing a practical machine, for the sake of the commercial payoff it would bring. The Centre for Quantum Computer Technology was founded in January 2000, with federal funding, and with participating teams in the Universities of New South Wales, Queensland and Melbourne. The striking thing was the confidence of project members about what they were attempting. A widespread opinion at the start of the 20th Century held that quantum computing was beyond practical reach for the time being. It was seen as requiring exquisite delicacy in construction and operation, with the ever-present danger that the slightest external interference or mismanagement could cause the whole multiply parallel computation to cave in, like a mistimed soufflé. Ten years later, when many others had joined in a prolonged experimental quest for quantum computing, IBM researchers at Yorktown Height s claimed to be within sight of a practical device within 10 or 15 years. Dogging all the experimenters was a problem called decoherence – would the qbits survive long enough to be checked for possible errors? Then it would be a matter of scaling up from devices handling one or two qbits to an array with, say, 250 qubits., That would contain more ordinary bits of information than there are atoms in the entire universe and it would be capable of performing millions of computations simultaneously. No existing code could withstand its probing, which probably explains why the US Army funded IBM’s work. A by-product of quantum computing research was the discovery of a new particle in the cosmos. 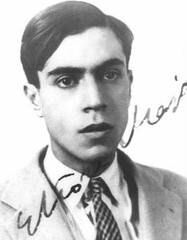 In 1937 the Italian physicist Ettore Majorana adapted a theory by the British Paul Dirac to predict a particle that is its own antiparticle – a very strange item indeed! It would be electrically neutral and exhibit peculiar behaviour. A team led by Leo Kouwenhoven at Delft University of Technology in the Netherland, tested experimentally a suggestion from 2010 about how to create a pair of these particles. At a very low temperature and in a magnetic field, you touch a superconductor with an extremely fine semiconducting wire. As the signature of the presence of “Majorana fermions”, confirmed by the experimental team, the resistance in the wire becomes very low at zero voltage. The Majorana particle opened a new route to quantum computing, because of its special ability to remember if it swaps places with a sibling. It was expected to be particularly resistant to the decoherence that plagued other techniques. So the Delft discovery promised a new research industry. I’d still like to trace just where the idea originated. I know that In 1967 I was predicting “beef-steak without a cow” in The Environment Game, a book that visualized the land areas needed for agriculture being greatly reduced. In 1983, my contribution to The Future of a Troubled World, pictured “endless sausages growing by tissue culture of pork muscle”. But now I learn that Winston Churchill was talking about “chicken breast without the chicken” back in 1931. Where did he get it from? I’ll go on checking. The Churchill quote comes in a segment in “Brave New World with Stephen Hawking” on Channel 4 (14 November). It follows up stories of the past few years about developments, most notably in the Netherlands, that are gradually making it a reality. Tissue culture itself is one of the most attractive ideas for artificial food production. It is no longer far-fetched to think that we may learn how to grow beef-steak, for example, without a cow. Tissue culture, the technique for growing cells outside the organism from which they originated, is already used for special purposes in research and also for growing viruses in the manufacture of vaccine; the advent of polio vaccine depended on the successful cultivation of kidney cells. That in turn followed the introduction of antibiotics to preserve the cultures from the ravages of stray micro-organisms. When cells are cultured by present techniques they tend to lose their specialized character. 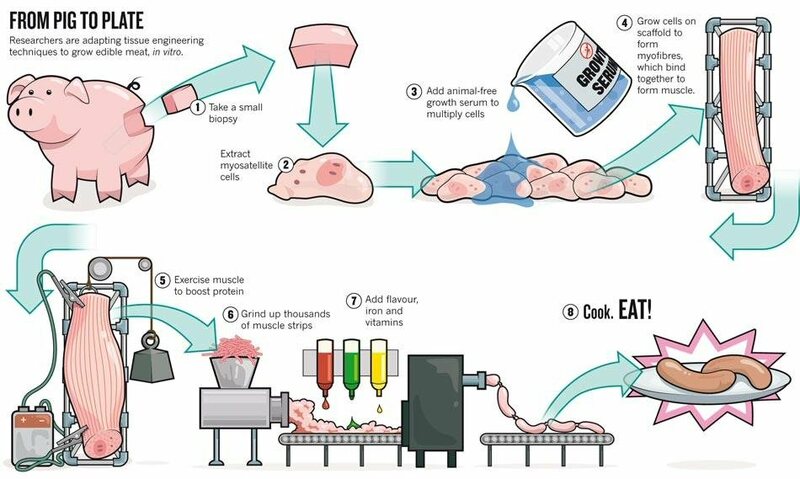 By deliberately letting specialized cells such as kidney or muscle revert to the undifferentiated nature of a newly fertilized egg, we can use them in a quite arbitrary way for a variety of synthetic purposes. If, on the other hand, we want to grow beef-steak we must simulate the conditions governing the growth and arrangement of the cells in the live animal, otherwise we shall finish up with something like finely divided mince. The Netherlands launched a well-funded multi-university project in 2005, and in the Hawking show, Mark Evans visits Mark Post at Maastricht University who shows him muscle fibres forming artifically. Post has some commerical backing and declares himself “reasonably confident” that next year (2012) he’ll make a hamburger. But with a price tag on the burger at 250,000 euros it’s “still in the scientific phase”. Besides reducing the land areas for meat production, eventual success with “in-vitro meat” will mean that astronauts bound for Mars can still have their burgers, sausages and chicken breast. As a science writer I’m well used to picking my way through the minefield of embargoes on papers not yet published. I know, too, of possible risks to scientists as well as journalists, when quoting from preprints or even reporting results presented at a conference. Publication can be cancelled. Results confirming climate change are welcome, even when released before peer review. The welcome is the stronger because the Muller results can be used against the Republicans in the USA. But Muller really should not have publicised his work as he did. Muller is wrong to claim that Science and Nature forbid the discussion of unpublished results – Nature only opposes pre-publicity. All that said, it was fine for physicists to give pre-publicity to apparent evidence of neutrinos travelling faster than light. What the new editorial means, in my opinion, is that the politicisation of science has now penetrated right through to the workaday rituals of publication. On no account must you publicise your new work prematurely, unless you do it to bash the climate sceptics or the Republican Party or supporters of Special Relativity or anyone else the editors happen to dislike today. In that case they’ll forgive you. Here’s a reminder of a climatic footnote to the 9/11 terrorist attacks on New York and Washington DC, ten years ago this weekend. With civilian aircraft grounded for three days, and without the contrails that usually criss-cross the skies of the USA, the difference between daytime and night-time temperatures at the surface increased. (See the Travis reference below.) Apparently like many other clouds (not all) the contrails reduce sunshine during the day and blanket the loss of heat at night. Take away those man-made clouds and the days become a little warmer and the nights a little cooler. In the jargon: the diurnal temperature range (DTR) increases. An echo of that mini-climatic event comes with the news that the DTR in Europe increases when there’s a big reduction in cosmic rays arriving at the Earth. With the implication that the skies are less cloudy at such times, it’s strong evidence in favour of Henrik Svensmark’s hypothesis that cosmic rays help to make clouds. The report comes from Aleksandar Dragić and his colleagues at the Institute of Physics in Belgrade. I’m grateful to Bengt Andersson for drawing their paper to my attention. It was published on 31 August and the full text is available here http://www.astrophys-space-sci-trans.net/7/315/2011/astra-7-315-2011.pdf It’s typical of the pathetic state of science reporting that I still seem to have the story to myself ten days later. The prime results are seen here in Dragić et al.‘s Figure 5. The graphs show the increase in the diurnal temperature range averaged across the continent in the days following the onset of cosmic ray decreases (day 0 on the horizontal scales). The upper panel is the result for 22 Forbush events in the range 7−10%, with a peak at roughly +0.35 oC in the diurnal temperature range. The lower panel is for 13 events greater than 10%. The peak goes to +0.6 oC and the influence lasts longer. It’s very satisfactory for the Svensmark hypothesis that the effect increases like this, with greater reductions in the cosmic rays. The results become hard (impossible?) to explain by any mechanism except an influence of cosmic rays on cloud formation. To be candid, these results are much better than I’d have expected for observations from a densely populated continent with complex weather patterns, where air pollution and effects of vegetation confuse the picture of available cloud condensation nuclei. Svensmark’s team has emphasised the observable effects over the oceans. Now the approach taken by the Belgrade team opens the door to similar investigations in other continents. Let a march around the world’s land masses begin! A. Dragić, I. Aničin, R. Banjanac, V. Udovičić, D. Joković´, D. Maletić and J. Puzović, “Forbush decreases – clouds relation in the neutron monitor era”, Astrophysics and Space Sciences Transactions, 7, 315–318, 2011. The experiment's logo. The acronym “Cosmics Leaving Outdoor Droplets” always implied strong interest in Svensmark's hypothesis. And the roles of the Galaxy and the Sun are acknowledged. For the dam that was meant to ward off a growing stream of discoveries coming from the spring in Copenhagen, the foundation was laid on the day after the Danes first announced the link between cosmic rays and clouds at a space conference in Birmingham, England, in 1996. “Scientifically extremely naïve and irresponsible,” Bert Bolin declared, as Chairman of the Intergovernmental Panel on Climate Change. “It’s the Sun, stupid!” The story isn’t really about a bunch of naughty Danish physicists. They are just spokesmen for the most luminous agent of climate change. As the Sun was what the warmists really wanted to tame with their dam, they couldn’t do it. And coming to the Danes’ aid, by briefly blasting away many cosmic rays with great puffs of gas, the Sun enabled the team to trace in detail the consequent reduction in cloud seeding and liquid water in clouds. See my post https://calderup.wordpress.com/2010/05/03/do-clouds-disappear/ By the way, that research also disposes of a morsel of doubt in the new CLOUD paper, about whether the small specks made by cosmic rays really grow sufficiently to seed cloud droplets. Henrik Svensmark, Jens Olaf Pepke Pedersen, Nigel Marsh, Martin Enghoff and Ulrik Uggerhøj, ‘Experimental Evidence for the Role of Ions in Particle Nucleation under Atmospheric Conditions’, Proceedings of the Royal Society A, Vol. 463, pp. 385–96, 2007 (online release 2006). This was the SKY experiment in a basement in Copenhagen. Martin Andreas Bødker Enghoff; Jens Olaf Pepke Pedersen; Torsten Bondo, Matthew S. Johnson, Sean Paling and Henrik Svensmark, ‘Evidence for the Role of Ions in Aerosol Nucleation’, Journal of Physical Chemistry A, Vol: 112, pp. 10305-10309, 2008. Experiment in the Boulby deep mine in England. M.B. Enghoff, J. O. Pepke Pedersen, U. I. Uggerhøj, S. M. Paling, and H. Svensmark, “Aerosol nucleation induced by a high energy particle beam,” Geophysical Research Letters, 38, L09805, 2011. Experiment with an accelerator in Aarhus. When ultra-cold rubidium atoms club together in the superatoms called Bose-Einstein condensates, they usually make untidy crowds, as on the left. But a team led by Stefan Kuhr and Immanuel Bloch at the Max-Planck-Institut für Quantenoptik in Garching, Germany, brings them to order in a neater pattern, as seen in the middle picture. With more rubidium atoms the superatom grows wider (right). Criss-cross laser beams create a lattice-like pattern of pools of light where the atoms like to congregate. When the laser light’s electric field is relatively weak, the atoms jump (by quantum tunnelling) from one pool to another, creating the usual disorder. A stronger field, as in the central and right-hand images, fixes them in the novel state of matter called a Mott insulator. But atoms can be lost from the condensate, which explains the ring-like appearance on the right. Images from MPQ. Single atoms are located at the sites indicated by circles. Fig. 3 in Nature paper, Sherson et al. see ref. 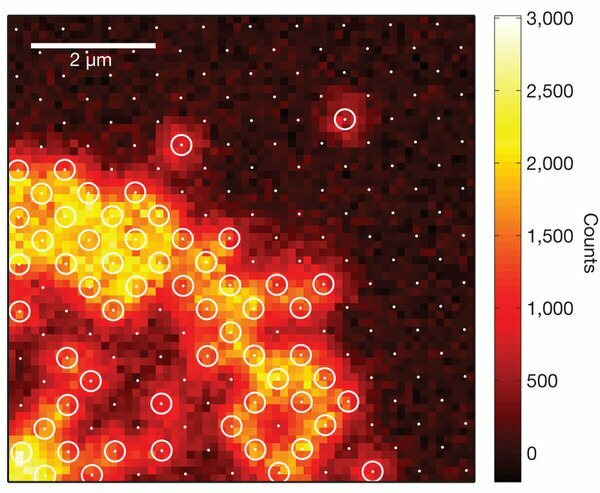 What’s new here, in an advance online publication in Nature, is not the creation of these kinds of superatoms but the German team’s success in imaging them, with a specially developed microscope that picks up fluorescence from the atoms caused by the cooling process. In the image on the right individual atoms are pinpointed. It’s exciting stuff, because we’re probably seeing the dawn of a new technology – after electronics comes “atomics”. If individual atoms in a superatom can be manipulated, they might be used to carry “addressable” information in an atomic computer.